This week we look at ways you can improve your competitiveness in the warehouse shipping room. As industry giants like Google work hard to speed up their customer order fulfillment – now delivering orders in as little as a couple hours in select urban locations — it’s time to review your own operations and see where you can make your shipping service more efficient – with fewer errors. Everyone has an opinion about how shipping stations should be set up — especially those who have never worked at a packing workstation! Avoid starting discussions on improving efficiency that start with what the shipping stations should look like and where the packing supplies are stored. Save that for last, after you’ve performed a comprehensive study of how your overall operations work. It may seem like this approach will take more time — and it probably will — but you’ll get better results in the end. Workers moving materials between different stations outside the normal flow sequence. Materials accumulating at the end of an automated process faster than workers can process them. Materials stacked on a temporary basis in different areas until they can be processed. If you uncovered indications of problems in the previous tip, it’s likely you have bottlenecks in the system. Study these issues further to find out the root cause of the problem. Pay close attention to the way your containers arrive at the shipping station. If the packer at the shipping station has to access multiple containers to get materials to complete an order, the containers are not arriving in the correct sequential order. This needs to be corrected. And if you observe the packer walking away from the shipping station to find an item, something is wrong in the staging process. Use the results to design a straight-line flow pattern shipping station. Each warehouse shipping room set up is different, but most shipping services follow a similar workflow pattern. Generally speaking, you start with picking the order in the warehouse, consolidating the order in tubs or containers, performing a quality check on the order, and then transporting the consolidated order to the shipping station. At the shipping station, the packer will pack the order into shipping containers (boxes, envelopes, etc. ), label the order and create the shipping manifest. From there, the orders are transported to the shipping dock. Take the time needed to document your operation’s exact, unique steps and keep this document up to date as you make changes. Once you’ve created documentation outlining the exact workflow steps, you can easily translate this into a design for a straight-line flow pattern shipping station. Diagram of straight-line packing flow shipping station. It’s important to stamp out errors in the order fulfillment process. One way to do this is by conducting a mental exercise where you consider the impact a mistake made at each point in the line will have. Can the mistake be discovered and corrected before an incorrect, incomplete or damaged product is shipped to the customer? Ideally, you can prevent mistakes (or at least catch them) before materials reach the shipping station. If not, the packer at the shipping station is your quality assurance tester of last resort. Therefore, you need to make sure the packer can identify and correct mistakes efficiently while keeping the line moving. Make sure you provide enough workspace for the packer to correct situations without a lot of fuss and bother when he or she is presented with the wrong SKU, the wrong count, the wrong product color, etc. To accomplish this, plan out the error correction sequence in advance. Make sure there is enough physical space at the shipping station to set aside the incorrect materials and replace them with the corrected ones. This includes provisioning enough space to make the correction; for example, there might need to be space on the shipping table for two boxes at the same time, the incorrect one and the corrected one. Equipment and Automation Tools: This includes items ranging from a scanner and keyboard, to tape shooters and gluers, to fill systems and dunnage dispensers. Packing Supplies: This includes envelopes, bags, boxes, labels, pens and markers, void fill material supplies, etc. Reference Materials: This includes training materials, reference charts, instructions, signs, charts, etc. Personal Items: Personal Protective Gear, jackets, purses, etc. Once you have all the equipment, packing supplies and personal items identified, rank them by priority. Category 1 items are used constantly, Category 2 items are used quite often, and Category 3 items are used infrequently. This ranked list will be critical for designing the packing station layout. The most efficient shipping station layout is generally acknowledged to be the straight-line flow pattern design. But the term straight-line, which describes the way the materials move, doesn’t limit the way you can store equipment and automation tools, packing supplies and personal items at your shipping stations. 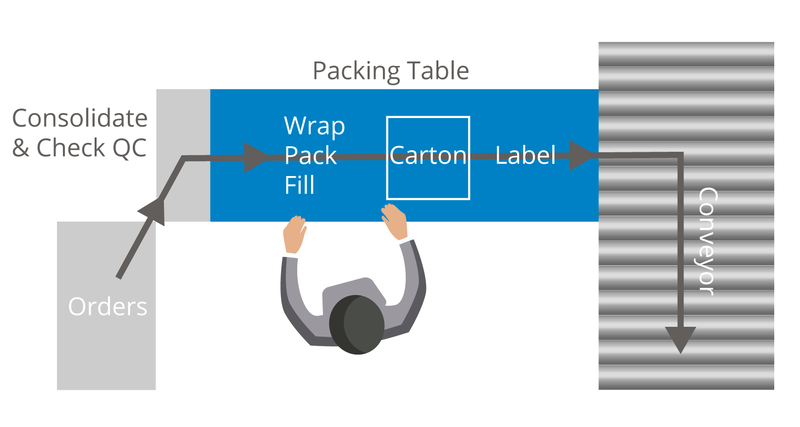 As you brainstorm about where to put your Category 1, 2 and 3 items, consider the available space surrounding the packing station in all three dimensions: there is room on the packer’s left side, on the right side, above the table, under the table and behind the packer. You can also create storage for bulky or rarely used items that swing or slide out of the way when not in use. While you are visualizing the design of a new or revised shipping station, it’s a great idea to mock up a test shipping station. You can order test configurations from Formaspace to try out, or you can create a prototype shipping station built out of materials like cardboard boxes and lumber. Make sure you have room for all the items you’ve identified in Tip 6, and be sure to place the Category 1 items where they are easy to reach. Have your experienced and inexperienced packers try out the prototype and get comments. And it’s never a bad idea to try it out yourself. Experiencing the workflow of the packing worker firsthand can help you uncover problems that you might not otherwise discover. Protecting workers from short-term or permanent injury is critical. Shipping stations need to be stable and secure. Let the equipment do the lifting for the worker. Install lifts and conveyors to raise, lower, and transport heavy containers. Avoid situations where packers need to physically stretch, twist or bend to perform their work. Another important consideration is designing packing stations for different sized workers. Formaspace offers shipping station solutions which can be adjusted to accommodate taller and shorter workers. With Formaspace, you can make fast configuration changes during shift changes with no downtime. Don’t get locked into shipping station designs that cannot be modified in the future. Things in the marketplace are changing rapidly, so you need to have the flexibility to reconfigure your shipping stations as your business grows. For example, as you increase your delivery rates, you might want to invest in new automation equipment which will need to be incorporated into your shipping station workflow. Thanks to Formaspace’s modular designs, it’s easy to reconfigure your furniture investment as your needs change. Find out more about our warehouse order fulfillment solutions today. Want to grow your warehouse fulfillment business? You’ve come to the right place. Formaspace has the right solution for your shipping stations. Give us a call today at 800.251.1505 to speak with a furniture solution expert. Find out why our American-made shipping stations and other industrial furniture is the right choice for leading companies like Apple Computer, Boeing, Dell, Eli Lilly, Exxon Mobil, Ford, General Electric, Intel, Lockheed Martin, Medtronic, NASA, Novartis, Stanford University, Toyota and more who choose Formaspace for their furniture needs.